Tips for Designing Your Classroom | Mahogany, Inc.
Design your classroom in 2019! 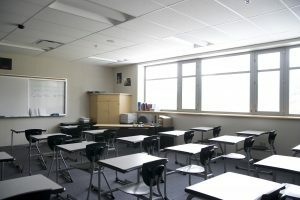 As you head into the spring semester, you may be looking for ways to improve your classroom for this season, or you may be already considering what changes you might make next year. Creating an effective classroom can be a challenge, especially since every student and every class will have different educational needs. That said, some features will remain more consistent that can give you a basis for classroom design. Kids need space to move. Staying active helps keep their minds engaged and more receptive to the classwork. With this in mind, you will want to adapt your classroom space to allow for enough movement. If you have a smaller classroom, this can be difficult, but it is possible. Having exercise balls to replace chairs, for instance, can help keep everyone focused without taking up too much extra space. One of the best ways to find the best seating style for your students is to change it up frequently. U shaped classrooms, for instance, allow everyone to have a front row seat. Different projects and learning styles may benefit from different arrangements. Creating separate areas within your classroom may not always be possible, but you should always try to have at least one section reserved for a quiet space. Some children are coming from homes where they suffer from poverty and worse, they may occasionally need time to themselves before they can more actively engage in learning. Having space for storage is one of the most important things you can do as a teacher. However, creating space for storage that isn’t adding to the visual clutter of your room can be difficult. Opting for under shelf and table options covered with a table cloth or skirt can be a huge help. Decorating a classroom is many teachers favorite part of the year. However, it’s important to remember that your decorations should help with the learning process and not distract from it. Leaving space to let your students have room to add their own touches can help them feel more at home and engaged with the area. We recommend a large whiteboard for them to add to at their discretion. This entry was posted on Friday, January 18th, 2019	at 5:21 pm	and is filed under Interior	. You can follow any responses to this entry through the RSS 2.0	feed. Both comments and pings are currently closed.